Bristol Pilot Cutters were amongst the last commercial sailing craft in the UK to be replaced by steam or diesel vessels. They worked continuously in the Western Approaches, in all weathers, delivering pilots to ships approaching the notorious waters of the Bristol Channel. 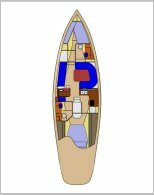 They earned a reputation for immense seaworthiness and a sea-kindly nature, almost unknown in modern yacht designs, and they have since been used to explore some of the remotest parts of the World, including the Polar Regions. 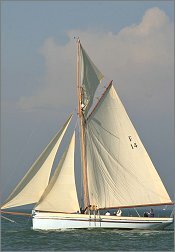 Merlin’s spars were made by Noble Masts in Bristol from Douglas fir and her rigging was completed by Dennis Platten, a traditional Bristol rigger. The gaff rig is powerful but easy to manage. 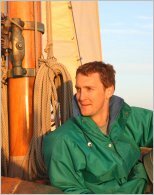 Her massive mainsail can be hoisted and lowered by one person and reefed quickly with an Appledore roller reefing system, perfected over 100 years ago. The boomed staysail is self-tacking and the jib and flying jib can be controlled easily from the cockpit. Once hoisted, the topsail needs little attention. The long Bowsprit retracts to make the boat easier to handle in harbour. Spacious teak decks and a comfortable cockpit area, protected by a surrounding coaming, offer plenty of scope for relaxing. The 18” bulwarks that run along each side, topped by lifelines offer security whilst moving around on deck and in heavy weather or at night, crew can clip-onto jackstays that run along the deck for additional safety.